YSU students and faculty attended a physical therapy conference recently. BEREA, OH (02/26/2019)— Gwendolyn Kunz of Galena (43021) was among the outstanding cast and crew from Baldwin Wallace University that presented “The Critique of the School for Wives” under the direction of Christine McBurney during the spring 2019 semester. Kunz, a graduate of Olentangy High School majoring in theatre design and technical studies, served as costume designer in the production. “The Critique of the School for Wives” is one of an extensive number of performance experiences providing real-world opportunities for students at Baldwin Wallace University. Productions include plays, musicals, operas, music concerts and dance concerts. Details at bw.edu/events. BEREA, OH (03/07/2019)— Blake Lewis of Westerville (43081) was one of 36 caring Baldwin Wallace University students who dedicated their 2018 winter break to making a difference through the BW Alternative Break service program. The program facilitated diverse community engagement projects with student volunteers traveling to San Antonio, Chicago, Washington, Seattle and Portland, Oregon. Each experience was led by a BW student with a University faculty or staff adviser providing support. Lewis, a graduate of Westerville North High School majoring in public health, volunteered to take part in the alternative break experience in Seattle and Portland, Oregon. The group explored the issues of sustainability and social justice in partnership with City Repair, Rebuilding Center, Friends of Trees and Food Lifeline. Students participated in hands-on service learning experiences as well as educational meetings with the people and businesses leading efforts toward sustainability that is able to positively influence social justice. The trip was led by BW student Emily Armbrecht with support from Marc West, BW Dean of First-Year Students. The BW Alternative Break service program provides students with opportunities to make a difference, travel to another area, learn new skills and meet people with similar interests. Participants commit to a six-week, pre-trip curriculum including issue education, organization orientation, team building and a full-day retreat on social justice and cultural competency. Alternative Break is one of many community service programs organized by the David & Frances Brain Center for Community Engagement to support BW’s mission of empowering students to become contributing, compassionate citizens. Community groups interested in partnering with BW can contact the Center at 440-826-2403 or BrainCenter@bw.edu. BEXLEY, OH (03/08/2019)— Capital University is pleased to announce its Dean’s List honorees for fall 2018 semester. In order to be named to the Dean’s List, full-time, degree-seeking students must have achieved a grade point average of at least 3.5. Gabby Fentress of Westerville (43082); Patrick Griffin of Westerville (43081); Katie Hammond of Westerville (43081); Alex Kerns of Westerville (43082); Hannah Leedy of Westerville (43081); Aleah Llaneza of Westerville (43081); Annie Mager of Westerville (43081); Regan Morgan of Sunbury (43074); Gabriella Pallone of Westerville (43081); Madison Pisano of Sunbury (43074); Jan Nina Sanchez of Westerville (43081); Madison Shutler of Westerville (43081); Macy Stith of Westerville (43081); Savannah Trace of Westerville (43081); Jonah Domingo Tugaoen of Westerville (43082). BEXLEY, OH (03/08/2019)— Capital University is pleased to announced its Provost’s List honorees for the fall 2018 semester. To be named to the Provost’s List, full-time, degree-seeking students must have achieved a grade point average of at least 3.70. Katlynn Bell of Westerville (43081); Liam Bruce of Westerville (43081); Alayna Cianelli of Westerville (43081); Torie Cochran of Westerville (43082); Hunter Dietz of Westerville (43081); Santino DiMichaelangelo of Westerville (43082); Jake Downs of Westerville (43081); Mel Kingston of Westerville (43081); Sam Knight of Westerville (43081); Cullen McGuire of Westerville (43081); Josh Pusecker of Galena (43021); Drew Selegue of Westerville (43082); Brooke Shutler of Westerville (43082); Alyssa Zumpone of Sunbury (43074). BEXLEY, OH (03/08/2019)— Capital University is pleased to announce its President’s List honorees for the fall 2018 semester. Capital has three lists denoting academic distinction among full-time, degree-seeking students: the President’s List, Provost’s List, and Dean’s List. The President’s List indicates the highest level of academic distinction. To be named to the President’s List, students must have achieved a grade point average of at least 3.85. Emma Burns of Westerville (43081); Cole Callaghan of Westerville (43082); Holly Deskins of Galena (43021); Noelle Garner of Sunbury (43074); Chase Geddis of Sunbury (43074); Hudson Haley of Westerville (43082); Jin Jin of Westerville (43081); Cristin Kenny of Westerville (43081); Carrie Kletrovetz of Sunbury (43074); Matthew Longfellow of Westerville (43082); Gabby Marinelli of Westerville (43081); Emma Price of Westerville (43082); Vanessa Sharpe of Galena (43021); Haley Sullivan of Westerville (43082); Kobe Swackhammer of Sunbury (43074). Located in the Columbus, Ohio, neighborhood of Bexley, Capital University is a private, four-year undergraduate institution and graduate school. Capital prepares students for meaningful lives and purposeful careers through a relevant liberal arts core curriculum and deep professional programs. Influenced by its Lutheran heritage, Capital places great emphasis on the free and open exchange of ideas, seeking out diverse perspectives, active participation in society, leadership and service. With a focus on rigor and experiential learning, the University capitalizes on its size, location, and heritage to develop the whole person, both inside and outside the classroom. 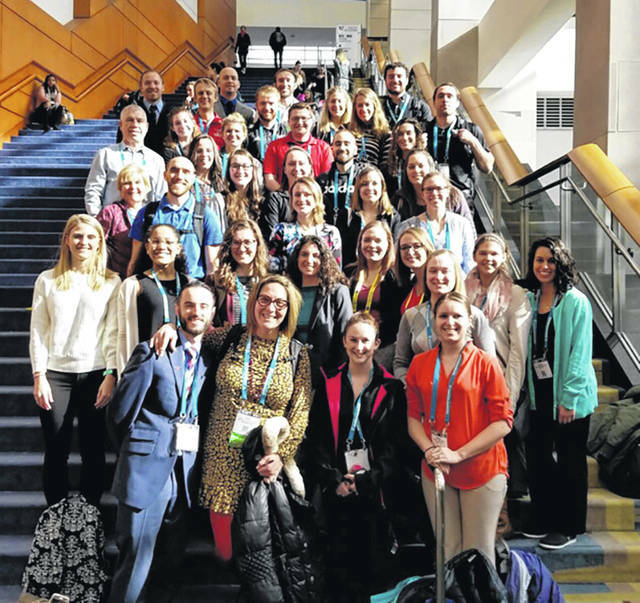 YOUNGSTOWN, OH (02/25/2019)— Alyson Jurcenko of Westerville was among nearly 40 students and five faculty members who attended the largest physical therapy conference in the nation with more than 13,000 therapists in attendance. Students participated in several educational sessions and poster presentations in the specialty areas of Sports, Orthopedics, Neurology, Geriatrics, Health Policy, Pediatrics, Cardiopulmonary, Acute Care, Women’s and Men’s Health, Electrophysiology and Research. https://www.sunburynews.com/wp-content/uploads/sites/48/2019/03/web1_ysu-pharma-group.jpgYSU students and faculty attended a physical therapy conference recently. Information for this story was provided by readMedia Newswire.